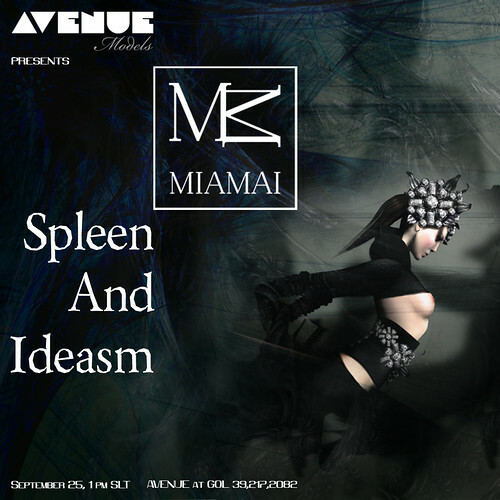 PR Contact: Aaliyah Munro, Marketing Executive, AVENUE Inc.
AVENUE Models is proud to present Miamai Spleen and Ideasm. Featuring the Fall/Winter 2010 Black Label collection, Miamai’s Monica Outlander has depicted the theme of eternal battle between the purity of light and the sensual temptation of darkness. Join us as we take an ethereal journey from what is familiar to the abstract in this adventure of the eyes and creativity. The German philosopher Ritter introduced us to the concept of Ideasm. It means that human nature needs a certain amount of ideals that are fantastic – basically impossible but they give us the challenge and drive to grow for them. It’s a twist on the Jungian Virgin Archetype – there is no perfect virgin, there never can be as perfection itself is an ideasm. But we need this Archetype to fuel our creative drives. This show takes place in a future, a time imaginable but just out of reach. It’s a dark age of austerity and beauty, a newborn culture. Nature has been doomed by the sophisticated intelligent machines that operate on humans in order to reduce them to a depersonalized army. Known for edgy couture with feminine appeal, Monica Outlander of Miamai continues to be in the forefront of high fashion media. With a collection ranging from delicate dresses to daring, barely-there swimsuits, your fashion palette is sure to be tantalized after getting a morsel of the meticulously created pieces of Miamai. AVENUE Inc, the parent company of AVENUE Magazine, AVENUE Models, AVENUE Models Academy, AVENUE Marketing & PR and AVENUE Studio, was founded by Rusch Raymaker, CEO in 2007. With a team of highly professional and qualified fashion, creative and marketing professionals, AVENUE strives to continuously promote the Second Life Fashion Industry to a higher level. Leading the first fashion track and publishing AVENUE Magazine in print at the Second Life Community Convention 2009, AVENUE continues to break new grounds in fashion, marketing and publishing within and outside of Second Life. For more information please contact Aaliyah Munro.